We asked Isabel, Senior Stylist at Ashbourne, to go to L’Oreal HQ in London for a Shu Uemura photo shoot. Isabel was briefed to create a futuristic Tokyo inspired model and we think the final look below perfectly captures this. This entry was posted in ASHBOURNE, BACKSTAGE, Competition, Editorial, INSPIRATION, L'OREAL PROFESSIONNEL, Shu Uemura Art of Hair and tagged Art Team, Backstage Stylist, HAIR, LONDON, lorealprofessionnel, PHOTOSHOOT, Sally Montague, SHU UEMURA, stylist on 24th January 2019 by emmanuelle. Have you ever dreamt of finding the ultimate hairdresser, who understands your wants and needs? I know the relationship you build with a stylist is incredibly important however sometimes I see clients visiting a hairdresser who simply isn’t right for them. With over fifty stylists in six salons across the group I know how difficult it can be to find your ‘hair match’, however I’ve always maintained that with just a short conversation I’d be able to pair everyone with their ideal stylist, whether it be a L’Oreal Colour Specialist, a curly hair expert or someone who excels in cutting short hair. Having partnered stylists and clients unofficially for years, I am now offering a complimentary ‘hair match’ service for one day at both the Ashbourne and Sadler Gate salons this April. Each appointment is a no strings attached consultation, lasting around fifteen minutes, where I can discuss your hair wish-list to identify your ideal stylist. Appointments are available throughout the day but spaces are limited, please call your chosen salon or email [email protected] to book. 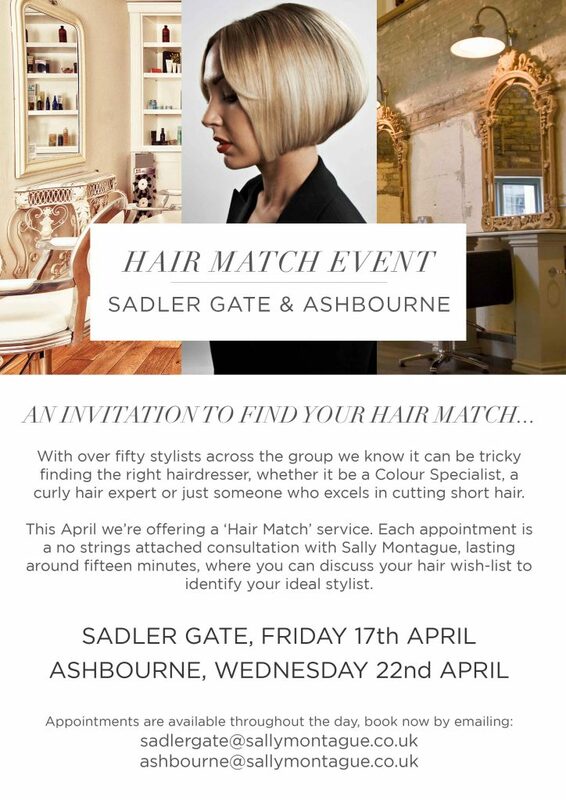 This entry was posted in ADVICE, INSPIRATION and tagged ashbourne, hair match, sadler gate, Sally Montague, stylist on 6th April 2015 by emmanuelle.